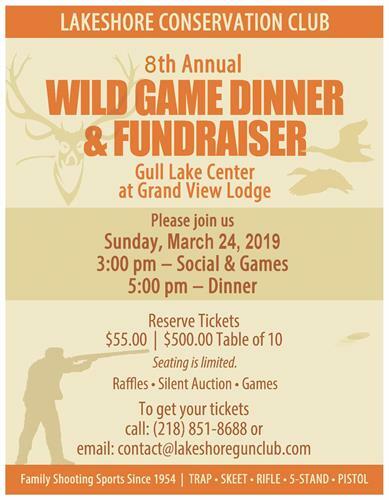 Join us for the Lakeshore Conservation Club's 8th Annual Wild Game Dinner & Fundraiser on Sunday March 24th. Cost: $55.00 for individual seat, $500.00 for Table of 10. RAFFLES – SILENT AUCTION – GAMES. Seating is limited. Tickets are on sale Labor Day weekend.